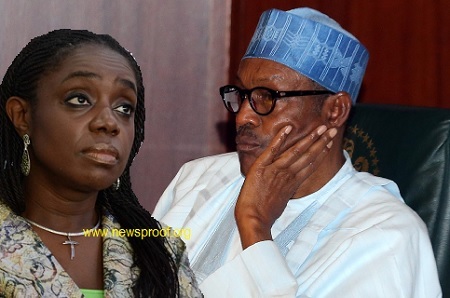 President Muhammadu Buhari has asked has asked the Minister of State for Budget and National Planning, Mrs. Zainab Ahmed, to oversee the finance ministry as from Friday after the Minister of Finance, Mrs. Kemi Adeosun, finally bowed to pressure by tendering her resignation letter to President Muhammadu Buhari on Friday. Her resignation followed a prolonged silence over an allegation in a Premium Times report that she forged her National Youth Service Corps exemption certificate. According to the statement, the President has asked the Minister of State for Budget and National Planning, Mrs. Zainab Ahmed, to oversee the finance ministry as from Friday. In her resignation letter, the former minister noted that she was shocked by the outcome of the investigation done on the allegation suggesting that her NYSC certificate, which she had earlier tendered as Commissioner for Finance in Ogun State, was not genuine. She said that in 2011, she tendered it before the Ogun State House of Assembly for screening as a commissioner and for clearance by the Department of State Services and was cleared. She said she got screened again by the National Assembly when she tendered it for ministerial screening in 2015. Adeosun said that not until the scandal broke out, she never knew the certificate was not genuine. The minister said she was born and brought up in the United Kingdom and that until she was 34, she had only been visiting Nigeria with her UK passport on holidays. According to her, she obtained her first Nigerian passport at the age of 34. She said until recent events, her understanding of the applicability of the NYSC law to her was that due to her residency history and having exceeded the age of 30 when she relocated to Nigeria, she was exempted from the requirement to serve. She said it was on the basis of that understanding and the advice of those she thought were “trusted associates” that the NYSC was approached and she received the exemption certificate in question. “I have, today, become privy to the findings of the investigation into the allegation made in an online medium that the Certificate of Exemption from the National Youth Service Corps that I had presented was not genuine. “I was born and raised in the United Kingdom, indeed my parental family home remains in London. My visits to Nigeria up until the age of 34 were holidays, with visa obtained in my UK passport. “I obtained my first Nigerian passport at the age of 34 and when I relocated, there was debate as to whether the NYSC law applied to me. Upon enquiry as to my status relating to the NYSC, I was informed that due to my residency history and having exceeded the age of 30, I was exempted from the requirement to serve. Until recent events, that remained my understanding. “On the basis of that advice and with the guidance and assistance of those I thought were trusted associates, the NYSC were approached for documentary proof of status. I then received the certificate in question. Having never worked in the NYSC, visited the premises, been privy to nor familiar with their operations, I had no reason to suspect that the certificate was anything but genuine. She also thanked Buhari for his patience in finding the truth in the matter. Adeosun stated, “Your Excellency, let me conclude by commending your patience and support during the long search for the truth in this matter. Thanking the President for the opportunity to serve, she said, “Your Excellency, It has been an exceptional privilege to have served our nation under your leadership and to have played a role in steering our economy at a very challenging time. I am proud that Nigeria has brought discipline into its finances, has identified and is pursuing a path to long-term sustainable growth that will unlock the potential in this great economy. “Under your leadership, Nigeria was able to exit recession and has now started to lay the foundation for lasting growth and wealth creation. Repositioning this huge economy is not a short-term task and there are no shortcuts, indeed there are tough decisions still to be made but I have no doubt that your focus on infrastructural investment, revenue mobilisation and value for money in public expenditure will deliver growth, wealth and opportunity for all Nigerians. “I thank His Excellency, the Vice-President and my colleagues in the Federal Executive Council for the huge pleasure and honour of working with them. I also thank most specially, the team in the ‘Finance Family’ of advisers and heads of agencies under the Ministry of Finance. Your Excellency, this group of committed Nigerians represents a range of backgrounds, ethnicities and ages.